I was recently asked if I'd like to go along to Debenhams in Meadowhall to have a complimentary Nails Inc manicure. Despite being a big nail varnish and nail art fan I've only actually had a manicure once before when I was a bridesmaid for my friend, so of course I jumped at the chance. I was completely rubbish and forgot to ask the names of the two Nails Inc ladies that were there but I believe their names were Sarah and Nikita (somebody please correct me if I'm wrong). Nikita was doing a manicure for a lovely lady next to me who was a personal trainer and Sarah did mine. When I got there I was very excited to hear I'd be having a Gel manicure*. I don't think I even have any gel nail varnishes at home (ones that you cure under a lamp or self dry ones) so this was definitely a first for me. Nails Inc offer several different types of manis/pedis including monogram manicures and crystal pedicures (the last one being £120 but the finished effect is beautiful!) and details of all of them can be found here. 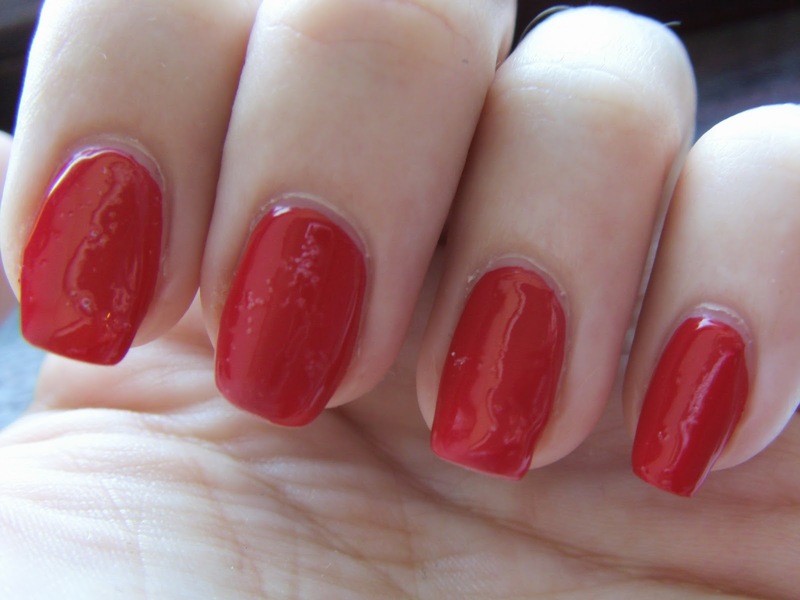 The Gel manicure takes 45 minutes and will last for up to three weeks. There's over 150 different shades to choose from and thanks to being cured (dried under a UV light) this dries quickly to leave a chip resistant super glossy finish. I picked out the shade I wanted and surprise surprise I forgot to ask what shade it was. I believe it may have been St James which is a quite traditional pillar box red shade and is one of their hero shades, meaning it's one of their most popular. Sarah started off by shaping my nails, sorting out my cuticles and applying something to my nails that would balance their PH to make it easier for the gel to adhere to them. She then applied the gel base coat and I popped my hands under the UV for it to cure. Then my chosen colour was applied to my nails. As she was painting my nails Sarah suddenly asked me if I'd be coming back over to have it removed at a later date. If you've never had a gel manicure before this isn't like standard nail varnish and can't be removed by just swiping a remover soaked cotton pad over your nails, it has to be 'soaked off'. It is possible to do this at home as you can now get at home gel manicure kits with UV lamps, but if you don't know what you're doing you can risk damaging your nails. As I wasn't going to be coming back to have it removed, and also I realised I needed to be able to get it off quickly if required for work (period roles and nail varnish don't mix! ), we decided it would be better if I just had a standard top coat applied over the top rather than a cured gel one. So my nails were finished off with two coats of Kensington Caviar top coat. I sat and chatted with the ladies for a while to make sure my nails were reasonably dry (as my top coat wasn't being cured) before heading back to my car to drive home. When I got home I was a little disappointed to discover that some of my nails had dried a little bubbly, which you can see on the picture above. The squiggly lines are just where the light is reflecting of the glossy surface. I believe the reason this happened was because I didn't have the full gel manicure and instead had two coats of standard top coat. I do sometimes have a problem where my top coat dries bubbly if I've accidentally applied a bit too much when doing my own nails. If you had a gel manicure yourself this would include a gel top coat which would be cured, so this wouldn't happen. When I left the lovely Sarah also surprised me with a goody bag (the picture at the top is the logo on the goody bag) which contained a few sweet treats (including a Kinder Bueno, yum), a bottle of Nails Inc branded water which everyone gets on the desk when they have their manicure but I'd not drunk mine and finally a few nail varnish goodies. Sarah also spent a little while giving me some tips on how to use the products she'd given me. To stop this post getting too long I'll save details of the products I was given and how to use them for another post so make sure you watch out for that one. I'm the sort of person that is always itching to change their nail varnish shade or try some new nail art out but if I was going on holiday or away somewhere for a number of days and I just wanted to not have to worry about my manicure lasting then I would definitely consider a Gel manicure. Have you ever had a Gel manicure? 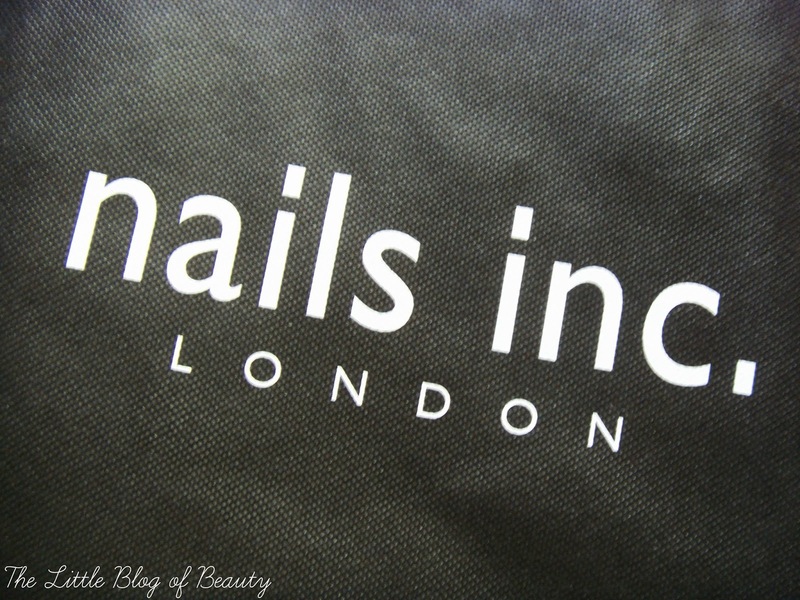 I'm all about gel nails at the moment so interesting to hear about Nails Inc's treatment. I've never had a gel manicure but would love to try it! Sounds like you had a nice day and the goodie bag sounds amazing :)!